Home » BLOGCHAIN » Pura Coin » PURA Vida – Show Your Love And Shop A PURA T-Shirt! PURA Vida – Show Your Love And Shop A PURA T-Shirt! Have You Bought Your PURA T-Shirt Yet? Visit Our New PURA Shop! PURA Vida everyone and Happy Monday! Are you back at work today in front of your computer and not sure how to start the week? Then make sure you check out the new official PURA Shop on our website! Make sure you get decked out in PURA merchandise to show your support. This is also a way to contribute to the community! We can’t wait to get pictures of you, your friends and your family with all of you wearing a new PURA T-Shirt. Make sure you send those pics in to us and we will post them here in the PURA blog, the BlogChain. We even have PURA socks! We know we have a busy community and you may have missed our article last week on the ways you can contribute to spreading the word on PURA. Here is a quick summary. 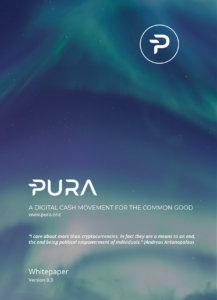 In short, if you do not have a lot of time to spare, make sure to tell your friends about PURA and invite them to join the PURA Telegram Channel. Share posts on PURA on social media accounts and spread the news on the PURA Merchant Registration Program. Help our community grow and spread the PURA Spirit – the PURA Shop is ready for your orders! PURA is a cryptocurrency to provide you and society as a whole with a foundation to practice decentralized social responsibility and contribution. To emphasize, PURA is for putting decision-making power on how to allot funds for common good back into the hands of people. The PURA community wants to make a difference. In detail, PURA wants to establish an environment that pioneers a new method of societal organization. This way, you can help to work towards the common good. In line with all this, thank you for being part of the PURA Community and for your ongoing support! Please read our Whitepaper for more information. the shirts are fair trade indeed.